It took me far longer than I'd like to admit before I finally recognized where the score came from and I was rather ashamed of myself when did. I feel like the last time I reviewed this movie, I thought that it was familiar but still considered it original music. Oh how silly of me. Borrowing the music from Alfred Hitchcock's Psycho is one of the more tasteful decisions the movie makes. It crazy how schlocky this movie is. I still haven't seen the rest of the series (although that may change with this horror marathon) but it's hard to imagine it getting any more absurd. There's a decapitated head that goes down on a girl. To make matters worse, the girl's father is mere feet from the act being perpetrated. How fucked up is that? For some reason that never stood out to me as severely as it did this time. 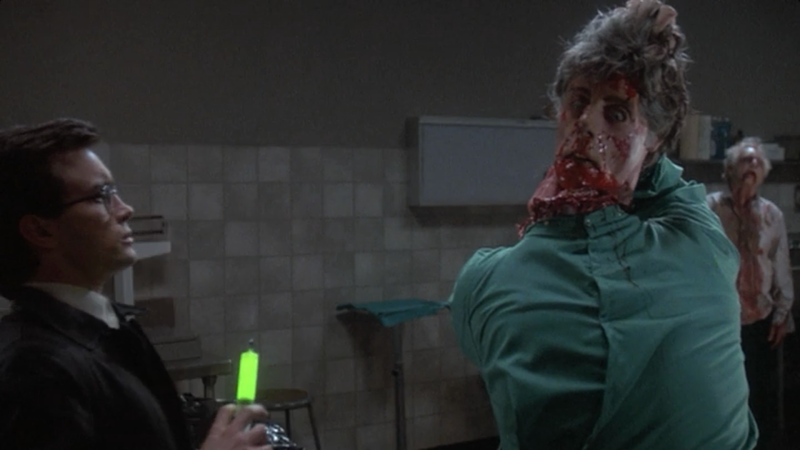 With all that said, it's still Re-Animator and it's still great. Even though I started noticing the trashy elements, it's such a well-made film that it's hard to hold that against it. Combs will always be remembered for his role as Herbert West and with good reason: he provides just enough creep, without every taking away his redeeming qualities. The beginning makes him into a monster, while we learn to understand his ways, and he's a misunderstood hero by the end.